Gossamer Gear was the first name I came across when looking for UL gear. The Mariposa backpack was totted as an awesome pack by many of the German and UK UL blogs I am reading, and the shelters, trekking poles and pads rounded out a very nice selection of UL gear. I got in touch with the two men who are behind the company, Founder Glen Van Peski and President Grant Sible, who's running the company today. This week Glen answers my questions, and next week Grant will tell his story and in which direction Gossamer Gear will develop. Glen on his trip in the Sierra, a couple of weeks ago. Glen, since when are you backpacking, and how did you start? How often are you out backpacking nowadays? I started backpacking as a Boy Scout, in Massachusetts. Our troop had a series of campsites in the local woods that we went to periodically. Each patrol had it's own campsite, improved with a fire pit, latrine, and all sorts of lashed furniture. Definitely not "Leave No Trace". When my sons joined Boy Scouts, in San Diego, we joined a troop that did real backpacking, culminating every year with a week-long trip to the Sierra. These days, my backpacking is somewhat limited. I have a demanding job as a civil engineer, as well as remaining involved in Gossamer Gear, but I still manage to typically get in 20 days of backpacking a year. When my oldest son joined our local scout troop, my friend Read Miller was the Scoutmaster. 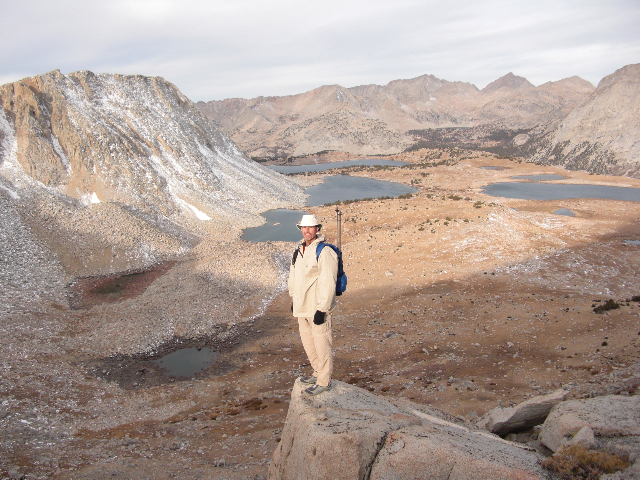 He read Ray Jardine's original book, The Pacific Crest Trail Hiker's Handbook, and started reducing his own pack weight. He got me to read the book also, and I started lightening my load about the same time. We challenged each other to move lighter and lighter, continually weighing gear. Gossamer Gear is one of the most outstanding UL cottage manufacturers, mainly due to the very popular backpacks, like the Mariposa and Gorilla. Can you tell a bit more about how you started the company, and how it developed over time? When I had to 'gear up' for our Scout troop's Sierra trek, I went to the local REI and explained I was going to the Sierra. They loaded me up with all the old standbys: An internal frame pack that weighed 7 lbs empty, a huge sleeping bag, a MSR stove with a set of aluminum pots and pans, sierra cups, insulated mugs, plates, steel utensils, rain gear, tons of clothes, big boots... a huge load of stuff. Upon reading Jardine's book, I figured out fairly quickly that a pack weighing seven pounds empty represented a great opportunity to lighten up. I made my first pack, dubbed the "G1" based very loosely on the Alpine Rucksack that Jardine mentions. I ended up using this pack for the next several years, even though it was big and ugly. My second attempt, the "G2" was made entirely out of 1.1 oz. silicon-coated nylon. My son Brian had the misfortune to use this pack on a John Muir Trail trip where it shredded. It was later reconditioned and traveled the California sections of the Pacific Crest Trail. Read and I started going on hikes outside of Boy Scouts. As we hiked along, we kept thinking up ways to improve the packs and make them lighter. This led to the, "G3" and finally the "G4". I provided instructions for making the G4 pack on a website. Periodically I would get emails asking if I would sew a pack for someone else, to which I would answer no. These were the very early days of ultralight backpacking, and the emails kept coming; and I finally started to feel bad about telling people "no". So I invested the time in generating a real pattern and detailed instructions, and lined up some people to sew. In the beginning the packs made locally, real locally, by my wife Francie, and other women in the neighborhood. The packs were custom orders, with the customer choosing fabric color and options. As the waiting list got longer, I decided I needed to see about getting the packs made commercially. I found a manufacturer in Seattle, and went through the iterative process of obtaining a suitable quality product. The manufacturer, who had previously made packs for major manufacturers, initially was nonplussed about making the packs. After a series of exchanges back and forth, with me explaining why they were still not right, the manufacturer summed it up with "These are not like other packs we've made..." That hurdle crossed, production started in earnest. The manufacturer told me that normally his minimum order was 100. I figured that if I had 25 packs made, everyone who wanted one would have one, and I could get back to my family and my engineering business. We compromised on an initial order of 50 - I figured I would have the packs in my garage for a few years, but that eventually I could get rid of them. Initially, the packs were available in one size, and four colors. It quickly became apparent that I had underestimated demand. Word spread quickly on the internet, and G4 production became an ongoing reality. My son Brian put together a website to take orders. Several years later, to accommodate new products, the website was completely revamped by my sister Brooke. In early 2004, the decision was made to ramp up GVP Gear, in an effort to generate a critical mass that would allow me to get back some of my life. By that time, the business was consuming a large part of my time, without contributing financially to my family. Rather than raise prices, we decided to increase the number of products offered to generate some synergy, and create enough volume to allow automated systems to be put into place. So the move to Gossamer Gear was launched. With the new products, including shelters, sleeping bags, stoves, raingear and many other innovative products, volume did soar. The order fulfillment portion of the business was outsourced, which freed up my time. Shipping was eventually brought back "in-house" when my wife Francie was looking for something to do now that the kids were older. Eventually, however, as more and more ultralight enthusiasts discovered Gossamer Gear's innovative products and low prices, my time managing the business kept expanding. Eventually I was working 60 hours a week on engineering and another 30 on Gossamer Gear (still without salary). I was making a good living with the engineering, so the money wasn't an issue, there just weren't enough hours in the day for living. When I could not longer handle it, I was prepared to have a big sale and close down Gossamer Gear. When I happened to share this with a longtime customer and dedicated hiker, he convinced me to bring in some equity partners who would hire staff and take the time burden off me. So in December 2005, the Gossamer Gear offices moved to Austin, Texas, where the new President, Grant Sible, hired staff and took over the day-to-day operations. I am still Chairman of the Board, and actively involved in product development, policy and vision, and of course product testing! There are more statistics and a timeline on our website, under "About Us". On the WTS course in the Wind Rivers. Gossamer Gear aims to be innovative, ultralight and affordable. Are you yourself developing still a lot of gear, or did Grant take over this responsibility? We actually both work on this. From his day-to-day running of the business, Grant has a much better idea of what customers are looking for. I am more interested in what I want to make. For instance, our most popular pack, and the only to be recognized as "highly recommended" by Backpacking Light, the Gorilla, was designed by Grant (Gorilla is his trail name). I work on items that are of interest to me, some of which never make it to production because there's not enough of a market for them. What is the most popular piece of equipment from Gossamer Gear? Hard to say. We are generally best known for our packs, and those generally are our best sellers. The G4, having been around for over 10 years, has a substantial following, including a Yahoo group devoted to people making their own G4 packs. The Gorilla will probably end up being our best seller after a year or two, as it provides a way for transitional hikers to lighten their loads. What kind of new innovations can we expect in the next years from Gossamer Gear? More "soft goods" like the complete pack raincover or also new "hard goods" like shelters and backpacks? We have a number of products we are pursuing. Unfortunately, with limited resources, we can't pursue everything we're interested in. We have a new one-person, double-wall shelter we're looking at, and several pack ideas. We want to do another 2-person shelter, and some lighter variations on our existing shelters. What is your own favorite backpack, and did you make it yourself? For many years, our pack line traced my personal journey in lightening my load: I started with the G4, then moved down to the G5 (no longer manufactured), and am currently using the Murmur. I used a prototype Murmur that I sewed myself for many years, but am now using a stock Murmur. It works great for me for trips 6 days or less without a bear canister. Since my total loads are typically below 15 lbs, I do not use the waist belt. You were hiking this with Backpackinglight.com's Wilderness Trekking II course. How did you like the course, and will you be on similar outings in the future? This year I had a great opportunity to help Andrew Skurka lead the Wilderness Trekking II course for BPL's Wilderness Trekking School (WTS). They have a great team at WTS headed up by Mike Clelland!. It was great to spend time with Andrew again, and I learned as much as the students I'm sure! 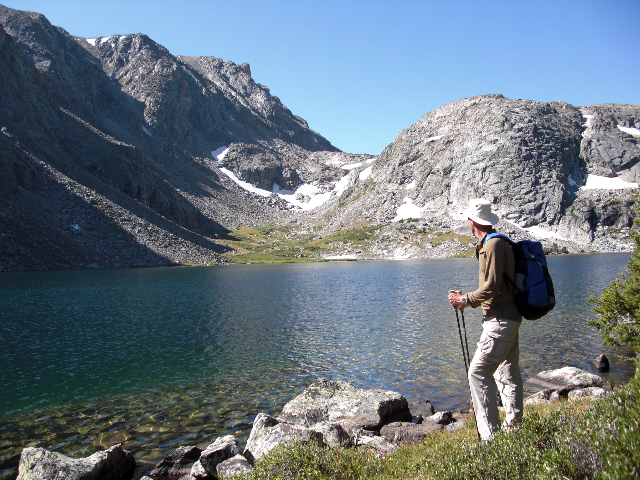 We were in the Wind River Range in Wyoming, which is beautiful countryside. I also participate in local courses through Wilderness Outings (WO), but the WO trips are in local mountains that I have traveled a number of times. Anyone who can get in on a WTS advanced course should do it. I doubt I will have time to participate in 2010, as I have been asked to do a lecture series and hike in Japan, and I have other planned trips as well. Ultralight backpacking HAS trickled down into the mass market, witnessed by the offerings of mainstream manufacturers. A lot of the innovation is still being driven by the cottage manufacturers, but you're seeing lighter and lighter offerings by the major manufacturers. Are you the cooperating "behind the scenes" with other cottage manufacturers? Are you for example in touch with Henry Shires from Tarptent, Brian Frankle of ULA or any of the other cottage manufacturers, and talking about developments and the like? A few of us cottage manufacturers get together once a year for our 'brain trust' hike (although in 2009, due to injuries, it ended up just being Henry and I). It's a great time to get together, trash talk each other's gear, and dream. We don't really formally collaborate on designs, although you can certainly see some common elements in some of our offerings. But we do talk about where things are going generally. Glen, I thank you for taking the time to answer my questions. Is there something you would like to add? My passion is getting out into the backcountry with light loads that maximize my time out there and my enjoyment of the time in the backcountry; and making gear available to help other people do the same. But the important thing is not the gear, it's getting out there!